for a one off payment of £25! Are you a Group interested in using the MUGA? Please use it as a family or come and get involved in the various sporting groups or even start your own – like the ladies netball group. Use this website and keep an eye on the notice board by the far gate for information and news of events. It is important for us all to enjoy the wonderful facility but at the same time we must look after it and maintain it. There is no magic pot of money so a joining fee is made for year round family use and a key for access is provided. Find out more on the Become a Member page. Members can use this website to book playing times by the hour. Please login. For group bookings, please request a booking from the Group Booking page and a key is issued to the group leader. For information on prices, please see the Price List page. Of course, the MUGA would never have been possible without the financial assistance of a number of grant authorities. 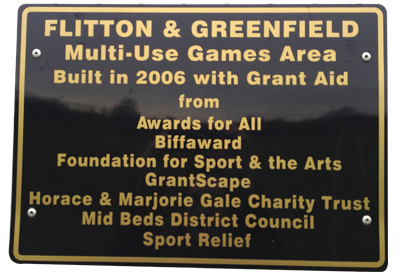 We thank Awards for All, Biffaward, GrantScape, Foundation for Sport and the Arts, Mid Beds District Council, Sport Relief and the Horace and Marjorie Gale Trust. There is a plaque on the fencing with all these names in appreciation of their generosity. We also thank the community for the support and fundraising during the development phase.